UH OH! Santa’s Elves decided to take an early vacation this year! Santa has to do all the shopping for boys and girls on his own! Help Santa out and make your list. Find the BEST price of your items and come up with a total! 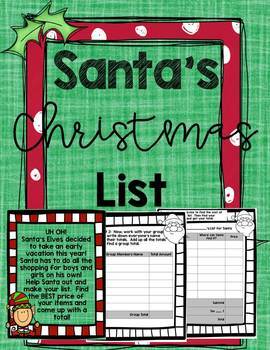 Students will love this fun and engaging activity where they have to create their Christmas List and then search for the prices. Students can use devices if they are available, or teachers/students can bring in retail fliers and catalogs for students to use. 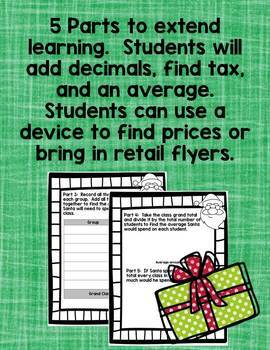 Students will then add decimals to find their subtotal, find tax for that state, and then find a total for their list. The activity then goes on with them finding a group total, and class total. The lesson can then be extended by finding a class average and school total. It also teaches students about comparing prices, which is just comparing decimals.